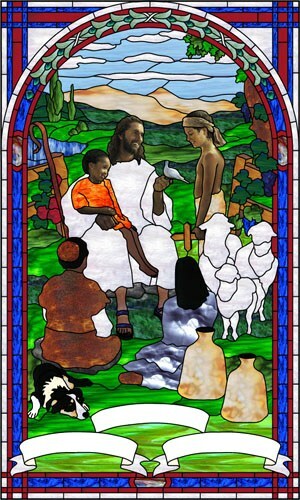 This artwork was designed for the Good Shepherd School in New Orleans. This is my second commissioned work and I am really pleased with the outcome. 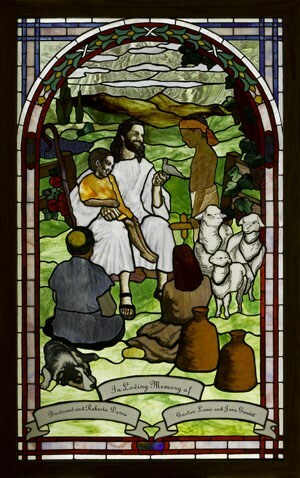 The benefactors that commissioned the piece found my original Good Shepherd on my website and requested something along those lines but with the inclusion of children as well as lambs. It morphed into a much bigger design, 30" x 50". I took several different parts of drawings that were on the public domain and scanned and loaded them into Glass Eye 2000 and then, after sizing the background to fit the overall design, created the outline freehand. The ability of Glass Eye 2000 to load in different backgrounds and to be able to create the design from the photo/drawing has been invaluable in doing the collage layouts that I do. I had to have several designs with different backgrounds. All told, we had the original Good Shepherd design and then five backgrounds with different images that finally compiled the design. It is a bit like putting a collage together. Each component, like the sheepdog, was printed to scale so I could paint the design onto the white glass that was used. Though it is three colors it required only two paint colors and three fusings, the original outline and tan and black colors. The main background including Jesus is the one included within the .eye design. NOTE: make sure the drawing is in perspective as I had to correct a perspective distortion on the child's head on Jesus's lap that I originally did not catch. Much better to work from photographs where possible. 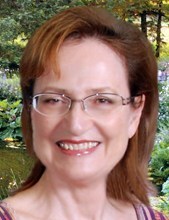 Ginny Trueman emigrated to America 23 years ago. Family finances precluded her completing her art degree, and she swore that when she was 60 she would pursue her art. Over the years she studied many art forms and now expresses herself in her stained glass hobby/small business. She began creating stained glass panels ten years ago, and for years afterward has created artworks for others as her own window and door space has begun to fill up. You may contact Ginny by email.